I’ve mentioned my to-try stack of recipes, but there’s actually more than one stack. There’s the physical stack of pages cut from magazines, there’s also a list of links I keep in Evernote, and there’s a board of recipes to try on Pinterest. It’s a little crazy to have to look in three places for ideas I know I put somewhere as a reminder to myself, but I usually eventually find what I’m looking for. A couple of weeks ago, I was searching for new-to-me brownie ideas. We were getting ready to attend an annual party, and more often than not, I take brownies to this party. This time, I wanted to change it up and take brownies with a twist of some kind. I wasn’t finding anything earth-shatteringly unique in my books. That’s when I remembered I had stored the link last year for this Guinness Brownies with Butterscotch Fudge recipe from The Little Epicurean. I admit, it’s the butterscotch fudge that grabbed my attention as butterscotch always does, and the pretzels on top just made me more intrigued. The recipe makes a lot of brownies in a nine- by thirteen-inch pan as opposed to the typical brownie recipe size of baking in an eight- or nine-inch square pan. So, this was perfect for a party. Making the brownies is an easy process that starts with melting chocolate with butter and then adding granulated and dark brown sugar. That mixture is then transferred to the bowl of a stand mixer, and eggs are added and mixed in one at a time. Flour, cocoa powder, and salt were sifted together and then added to the batter alternating with Guinness. Last, chocolate chips were folded in before pouring the batter into a parchment-lined baking pan. After the brownies baked for about 30 minutes and cooled, the butterscotch fudge frosting was made. Butter was melted with dark brown sugar in a saucepan. It was left to simmer for a couple of minutes, and then salt was added off the heat. With a stand mixer, confectioners’ sugar, cream, and vanilla were mixed, and then the butter and sugar mixture was incorporated and mixed until smooth. 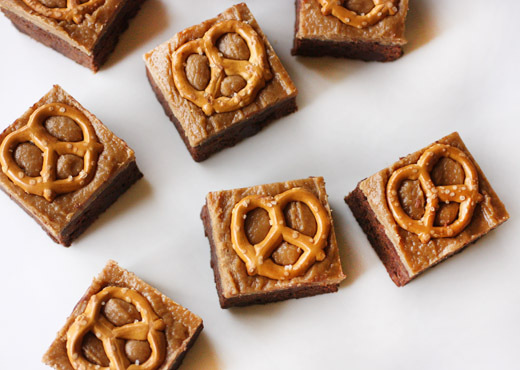 The fudge frosting was spread over the cooled brownies, and pretzels were added on top. Explaining that these brownies were Guinness brownies was all most people needed to hear before grabbing one or two. And, the addition of Guinness did bring about a lovely, tender, cakey brownie. The sweet butterscotch fudge frosting and the salty, crunchy pretzels on top were ideal embellishments. The tray of brownies was empty long before the party ended. Amazing! Those brownie look and sound terrific. What an awesome flavor combo. Serious yum! I have a Guinness sitting on the counter waiting for me to create a recipe in honor of St. Paddy's Day. I think I will be using some for these too! 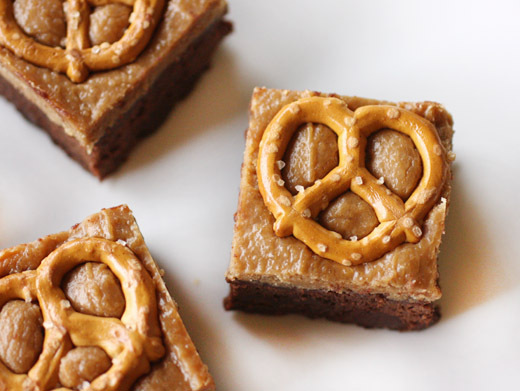 Pretzels and brownies are a combination I'd never heard/seen before. As if brownies weren't good enough on their own, you've taken them to a whole new level! Amazing combination of flavors, never would thought of those together... I am a lover of all things butterscotch. ummm, i am trying these this weekend. beer, butterscotch and salty preztels!? i'm in!!! thanks Lisa! Wow! Sounds perfect for St. Patty's Day. I usually go for a fudge brownie, but that combo of Guinness, chocolate, and salty pretzels is calling my name. This is a lovely treat for St. Patrick's Day treat and they look really pretty too! What a fabulous brownie recipe! With the salty crunchy pretzels and butterscotch topping they are an extraordinary party treat! Oh gosh, these look amazing. Not that I ever tire of brownies but this is a nice spin. 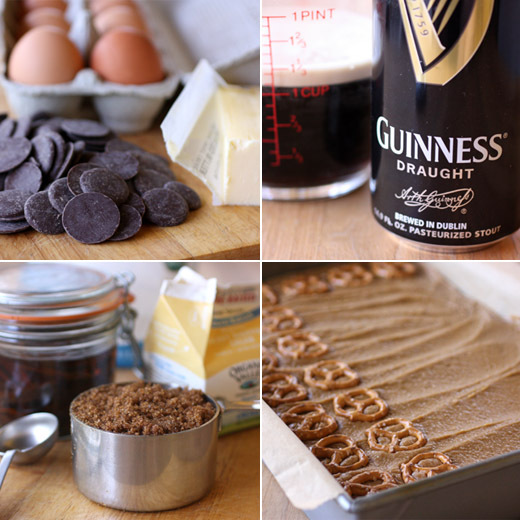 Guinness, butterscotch, and pretzels- it's almost too much goodness to take. O My...these brownies look out of this world tempting! Love the hard prezels topping. Love the pretzels on these! And I'll take Guinness in anything. Really creative and good stuff - thank you. i like the look of these, lisa, and i LOVE the idea of a butterscotch fudge frosting! excellent find! i love evernote! and omg these look killer! i've been itching to bake with a stout that has been sitting in the fridge, these sound perfect! These brownies are totally over the top! I love pretzels paired with something sweet. Wish my brownies looked that pretty when I cut them. Those brownies are beautiful! I love the flavor combo and bet the pretzels make a great addition! I have recipes I want to try in cookbook, stacks of recipes I've printed, torn out, etc, and tons (I mean tons) of bookmarks. And yet sometimes I am totally uninspired. Go figure! Wow! I made my first chocolate stout cupcakes and the flavor was intriguing and very adult. I'll bet these brownies are even better! Adding the pretzels is genius!